Complete Overview: Designed as a replacement for all of Dometic's® oringinal ""Black box boards"". Used to replace boards with part numbers beginning with 293. Our board has an improved thermocouple circuit to eliminate the ""Recurring check light"" problem. 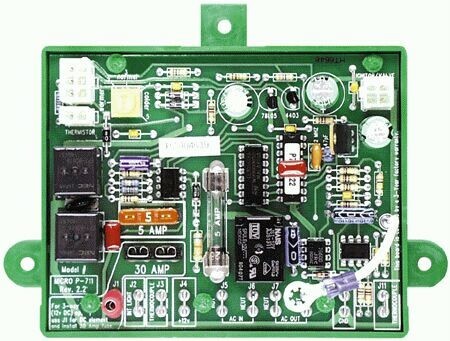 The board comes as a 2-way and can be used as a 3-way by adding the supplied fuse. It is fuse protected on the 12 VDC, DC element circuit, and 120 VAC circuit. A food saver feature keeps the refrigerator operating if the eyebrow board communications link fails. A knob on the circuit board allows you to fine-tune the temperature of units equipped with a temp selector, and allows you to choose from the full temperature range even with fixed temp refrigerators. Complete instructions makes installing this circuit board simple, all connections are clearly marked. This board works with or without the ""Ground problem"" wiring kit.